This weekend the Scranton MMA Judo competition team headed over to paterson New Jersey to compete in the Summer Slam Judo Tournament. This tournament brings out players from the very best clubs in the country and Scranton MMA was very glad to take part of this event. Members from Scranton MMA have been going to this tournament for years and years and we are very happy to see some of our new members and new competitors go to this tournament. Going to this tournament we knew we would have our hands full. We had four kids competing for the first time and to be honest most of them have very little Judo experience or time training Judo. Despite the lack of experience all of the kids did GREAT! Each kid who was competing for the first time was able to win at least one match and all of them placed in their division. One of our members had the opportunity to compete against the best player in the country at that age and despite losing it was a great opportunity for our player to see what a high level competitor is like at that age. Many of our members were able to utilize their Gracie Jiu Jitsu experience at this Judo tournament. A lot of people do not realize that there are basically four ways to win a Judo match and three of them are on the ground. So obviously being good at Gracie Jiu Jitsu helps out a great deal. We had two of our kids who were competing in Judo for the first time win matches by passing the guard, establishing yoko shiho gatame or Side Control and then obtaining Tate Shiho Gatame or the mount. A Judo match will end if one person can maintain any type of side control or mount for 20 seconds. Both of these kids displayed great technique and control during the match and it was great to see their BJJ training pay off for them in a big tournament. BJJ also helped all of our members either stay safe while they were on the ground getting attacked or allowed them to escape from a bad position that would have lost them the match if they were not training in BJJ. We did also have one of our members win via submission in a gold medal match. This player was able to trip or knock his opponent down and then continued into groundwork and passed the guard, established side control, then switched to side control on the opposite side, trapped the arm and applied a paper cutter choke just before time expired to win the match and secure the gold medal in the division. That same transition from side body on one side to side body on the other side is something that the BJJ instructors at Scranton MMA have taught him and drilled with him countless times and it paid off in a big way at the tournament. At the end of the day Scranton MMA finished up with 2 gold medals, one Silver medal and two Bronze medasl. Most of those medals came from our kids who were competing for the first time which made all of the coaches and parents very happy!!!! Please take a minute when you are at the academy to congratulate THE KIDS for going out and competing and testing their martial arts skills in a tournament. It can be very stressful for a kid to get the courage to go out and compete. Luckily they all had a great time, made some friends and all would like to compete again sometime soon! Here are a couple pics from the tournament. 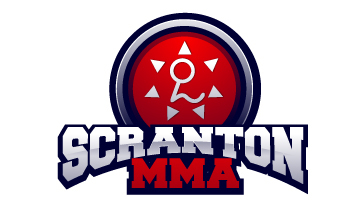 You can see a lot more by going to our Scranton MMA FaceBook Page.